HT ColorFabb filament is a very resistant filament made out of Eastman’s Amphora HT5300 material. HT filament is odorless during printing and does not contain styrene or bisphenol The filament is very solid and can resist very high temperatures. ColorFabb HT filament is ideal for creating exposure models and also for the production. This filament is available in spools of black, white, natural, light grey, and dark grey. 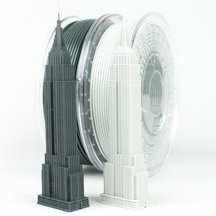 ColorFabb HT filament has the best mecanical performances and also the best resistance to heat compared to XT and nGen filaments from ColorFabb. ColorFabb HT filament has the particularity of being even more solid than ColorFabb’s XT and resistant to heat. It may resist a temperature of 100°C without getting deformed. The HT ColorFabb filament is a professional filament, aimed at people who need solid and long-lasting objects. It is ideal for making mecanical objects or prototypes, the HT filament is perfect for an industrial use. For your 3D printing that may need a high resistance to heat or an excellent solidity, HT filament from ColorFabb is the filament you need. ColorFabb HT is a difficult filament to print which is mainly for experimented printers. It is a filament that needs to be printed at a very high temperature. We advise you to set the extrusion temperature between 260°C and 280°C. Your 3D printer must be equipped with a heated plate for printing HT filament. You will therefore avoid any deformation of the object during the printing. It is recommended to heat your plate between 110 and 120°C. For printing large objects which have a bigger contact surface with the plate, it is even advised to apply a BuildTak support in order to have a better adhesion. Finally, so as to to obtain 3D quality prints , the extrusion speed of the HT ColorFabb filament needs to be between 30 and 50mm/s.